Never thought my home town would have a wiki page. 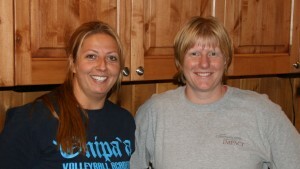 July 07 – Kerry came and visited while attending a class in Denver – we played sand volleyball in Boulder, CO together. 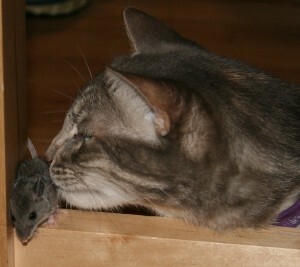 Aug 07 – Boulder (our cat) caught a mouse in the house. The picture says it all – she was super sweet with it. Sept 07 – Helped my Mom and Dad with prep work for moving into their temporary place. This is the last time I’ve been back to Greensburg – need to figure out if I can go to the class reunion in May 2009. Oct 07 – visited Dave’s family in Montreal. 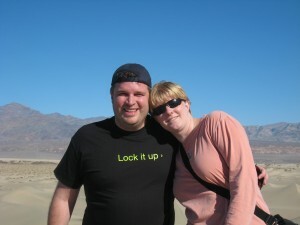 Jan 08 – visited Las Vegas and Death Valley – Death Valley in the winter is amazing. 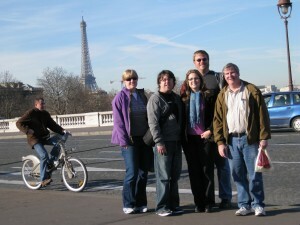 Feb 08 – Dave called and said he booked me a plane ticket to Paris, and we departed the next week. I hope to go back someday in the spring/summer to see the flowers. 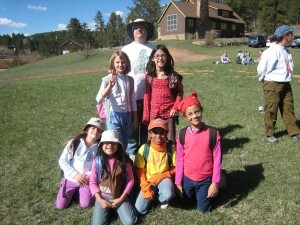 May 08 – My Girl Scout Troop went to Magic Sky for their first “real” camping experience. The day after we got back they bridged to Juniors. Mar 08 – played in the CG Volleyball Tournament and caught up with a bunch of friends in CT. Will schedule more time if I’m invited back this coming year because I missed seeing a lot of folks that I would’ve like to have caught up with. Summer/Fall 08 – played in 3 different grass tournaments with 3 of the women volleyball players I’ve met here in Boulder. My partner and I broke pool play at Steamboat. Aug 08 – had a houseful with Dave’s family (6 relatives) and then my parents’ joined the crowd at the end of the visit. Sept 08 – Dave became a US Citizen! Fall/Winter 08 – playing with the “Flintstones” again this fall and winter season as well as a co-ed team. 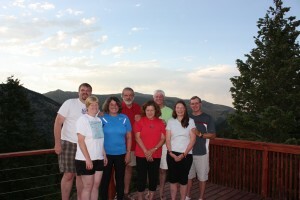 They are my hard court volleyball teams – we are playing D1 and holding our own. I have the opportunity to run the offense for the team as part of the 6-2. It is a lot of fun to set at a competitive level, and I’m starting to get asked to sub as a setter which is pretty cool. Nov 08 – I went to see my cousin Andrew’s band competition. It was one of the last performances of his senior year. 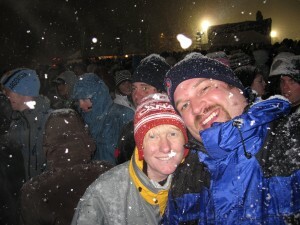 Dec 08 – went to see The Fray at Vail Snow Daze. 3 inches of snow fell during the concert. Jan 09 – saw a Jonathan Coulton concert at the Soiled Dove in Denver. re: Your Brains is a great song and because I work with a bunch of engineers Code Monkey has a warm place in my heart as well. Great concert! Jan 09 also included a wildfire in our district that missed our house literally by a mile. The way folks pulled together and helped out to keep the damage to an absolute minimum was amazing considering that the winds were pushing the fire at 50-80 mph. Both Dave and I were on call, so the cats spent the evening in their carrier and we had a friend who would take them out if our housing area was evacuated since we could not come pick them up. My mom and I have taken one 4 day cooking class and one 1 day cooking class together with Chef Cheyne Keith. He is amazing and we have had a wonderful time learning about small sauces and how to use our food processor. Dave and I have become Rally Cross fans – he is getting quite good considering the car we drive. Dave became First Responder certified so he is now qualified to respond to medical calls in our fire district. I have been very blessed to share the last 7 years with Dave, and he has shown time and time again his love and support for me, our families and the community. This is my attempt to catch-up anyone who actually comes to my blog on the last year and a half. I will try to do a better job of keeping it up to date. 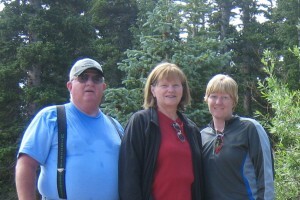 Hope to hear from folks who do visit my blog soon – I now have a facebook page. This entry was posted on Sunday, February 1st, 2009 at 7:02 pm	and is filed under Uncategorized. You can follow any responses to this entry through the RSS 2.0 feed. You can leave a response, or trackback from your own site.